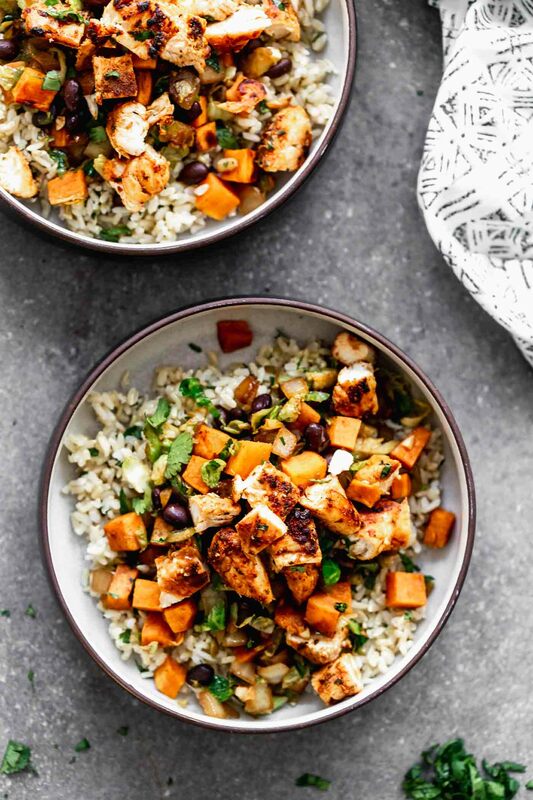 When cookie consumption, daily 9-ounce pours of red wine, and endless bowls of pasta are no longer part of getting into the “holiday spirit,” but instead getting you into trouble via your pants having trouble buttoning, look no further than today’s Blackened Chicken Brown Rice Bowls with Avocado Cream. These bowls are pure magic. They do everything pasta, a glass of wine and cookies do for me – which is make me very very happy – but they don’t leave me feeling like I need to step on the treadmill afterwards. 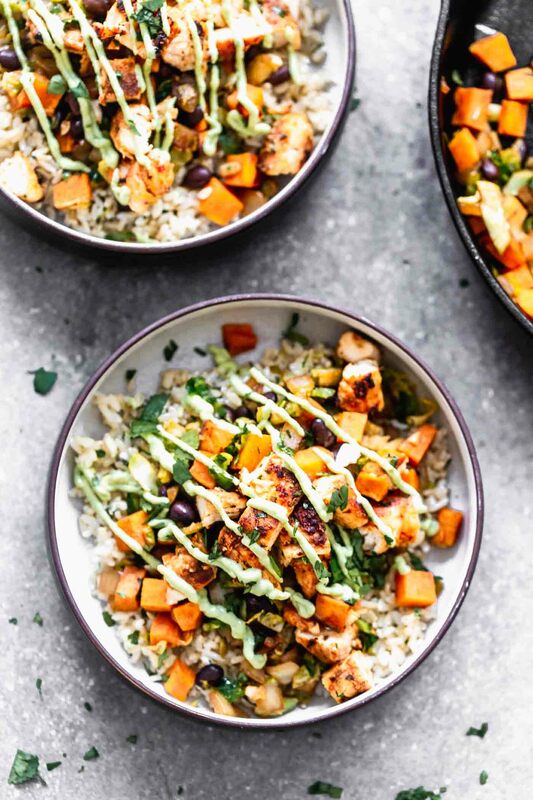 Packed with hearty brown rice, super flavorful chicken, tons of fall-inspired veggies and a zippy avocado sauce, these bowls are the perfect way to balance out all your overindulging during the holidays. I’ve found out a secret, although I’m not sure that it’s a secret. I’ve always made my own rice at home. My mother-in-law got me a rice maker for Christmas years ago, and it makes the most perfect, fluffy, sticky rice I could never achieve on the stovetop. I’m obsessed with it. 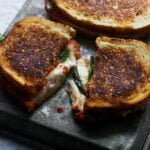 It’s probably one of my favorite kitchen gadgets and we use it ALL THE TIME. The only problem, is to cook brown rice, you need at least 45 minutes to an hour for it to cook properly. If I’m ahead of the game and have our meal planned out for that evening, I’m all good, but in the times I throw something together at the last minute, it’s a no go. I recently went out on a whim (for me) and bought the Trader Joe’s frozen organic brown rice, and I was pleasantly surprised how wonderful it is. 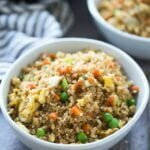 The texture is ALMOST as perfect as the rice I can make in my rice maker and it only takes three minutes in the microwave to cook. So on the days where I’m whipping up something quick, like these bowls, the ready-to-go packaged rice is my go-to. It’s a rare occasion that I serve the rice is, and today is no exception. Although I kept things pretty simple, I added in a generous amount of chopped cilantro and touch of salt to give the blank canvas just a hint of flavor. 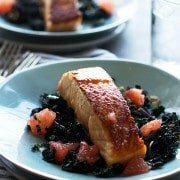 You could also add a squeeze of lime juice, a little dash of cumin or even a little bit of paprika to add even more flavor. I want to call the chicken element of these bowls, basic, but that would be doing it a huge disservice. It’s “basic” in the sense that there’s only a few ingredients and a minimal amount of prep. 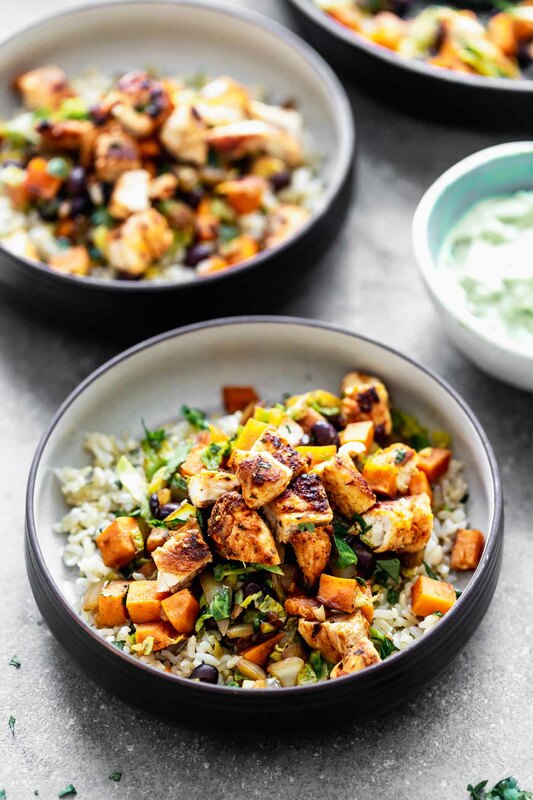 It’s not basic in the sense that those minimal ingredients and prep time, result in chicken that’s so flavorful, it can easily be consumed on its own sans the addictive avocado sauce. It’s my go-to blackening combo, and something I come back to time and time again for chicken. 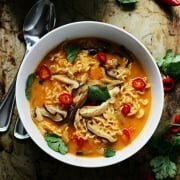 Sometimes I’ll add in a dash or two of cayenne pepper for a little heat, but since I’m serving a baby and a toddler as well, I steer clear of anything overly spicy. Also, if I’m looking for a bit more of a smoky flavor, I’ll also add in little bit of smoked paprika, which would work perfectly here. The veggies, are up to you. I went the seasonal route with roasted sweet potatoes and brussels sprouts, but any combination of peppers or squash will work great. While the sum of its parts is greater than the whole, I’d be remiss if I didn’t gloat a little bit about the avocado cream sauce that drizzles the top. Everyone in my family went kind of crazy for this – including my nine month old and my hard-to-impress husband. It’s creamy, zippy and totally addictive. And it’s super healthy – win! It’s only three ingredients – avocado, lemon juice and Greek yogurt – so it’s easy to throw together. Like the chicken, it’s also adaptable, because a little bit of garlic or cumin would be a great addition. I didn’t even use a blender or food processor to puree it, I just mashed the avocado with a fork, vigorously whisked the Greek yogurt in, followed by the lemon juice and then seasoned it with salt and pepper. To make the presentation extra pretty, I transferred the mixture to a ziplock baggie, cut the end off, then artfully drizzled it on top of the bowls. A sprinkling of chopped cilantro rounds the final product off. 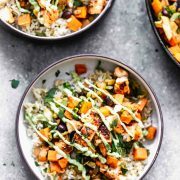 Blackened Chicken Brown Rice Bowls with Avocado Cream: A healthy, hearty way to get your grains, veggies and good fats! And SO good. Preheat oven to 375 degrees. 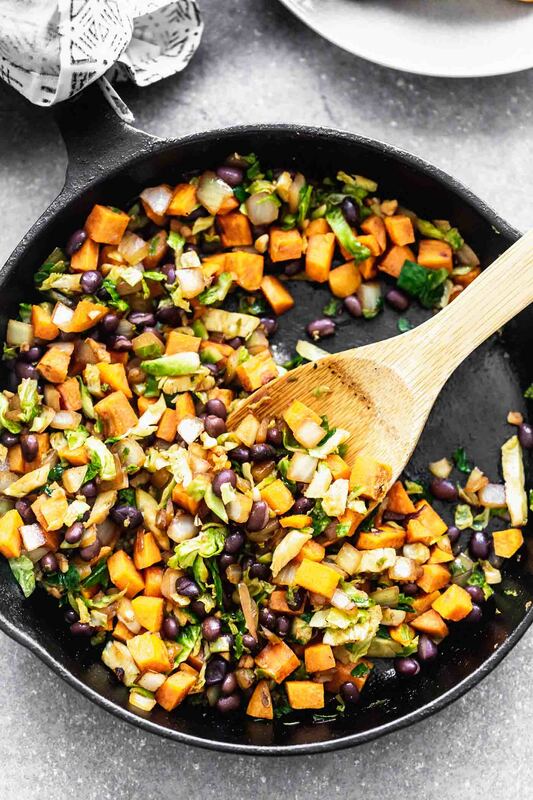 Add sweet potato to a large bowl along with 1 1/2 tablespoons olive olive, 1/2 teaspoon salt and cumin. Toss to combine everything together. Spread on a baking sheet and roast until soft, about 15-20 minutes. 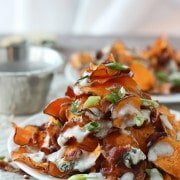 While the sweet potato cooks, add the garlic powder, paprika, oregano, onion powder, and 3/4 teaspoon salt to a small bowl. Add chicken to the same bowl you tossed the sweet potato in, toss with spice mix until evenly coated. Heat a large cast iron skillet to a medium heat. Add 2 teaspoons of olive oil. Once the pan is hot, add chicken. Cook until blackened and cooked through, about 3-4 minutes on one side and 2-3 minutes on the other. Remove from the pan. Add remaining olive oil the pan along with onion, Brussels sprouts and garlic. Sauté until onion, Brussels and garlic and all softened, about 5 minutes. Season with a little bit of salt and pepper. Remove from heat until sweet potatoes are cooked. Cook rice according to package directions. Toss with chopped cilantro and season with salt and pepper. To assemble. Put rice in the bottom of 4 bowls. Top with onion Brussels sprout mixture, sweet potatoes and chicken. Drizzle with avocado cream (I like to put the cream in a small ziplock bag and cut the tip off to drizzle easily) and sprinkle with cilantro. Put avocado in a bowl. 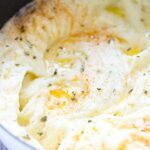 Mash really well with a fork. Add Greek yogurt. Continue to mash so you have very little lumps. Add lemon juice, whisk until smooth. Season with salt and pepper. 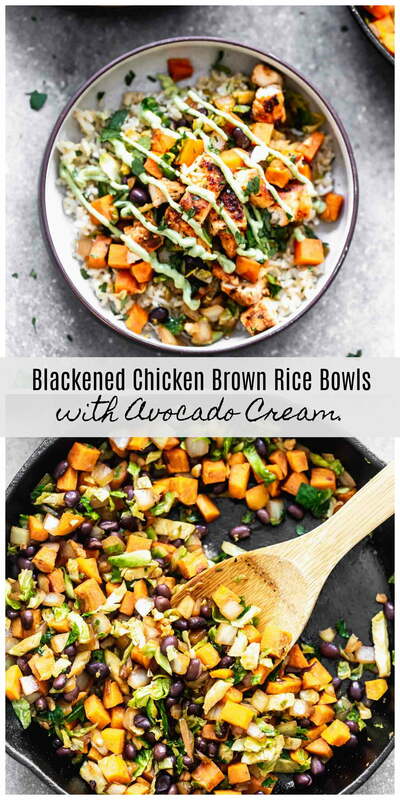 3 Responses to "Blackened Chicken Brown Rice Bowls with Avocado Cream"